You deserve a government that spends its money as wisely as you do. Washington needs accountability, transparency, and more leadership to get our country’s fiscal house in order. For too long, Washington has spent money it doesn’t have without any regard for the future. Some could say that was until Donald Trump was elected … but Erik Paulsen’s questionable spending has been cited before in the Strib link and on the MN Political Roundtable link. Yep, the self-professed fiscal conservative, Congressman Paulsen has been known to use funds from his Members’ Representational Allowance (MRA) that seem to be unnecessary. Congressman Paulsen’s budget was $1,251,746.00 in 2016 but for 2018 it is $1,351,746.00. Yep … you read that correctly, the man who preached of the need to restore fiscal discipline saw his budget increase by $100,000 ! Now, a budget doesn’t mean actual spending … and some Members of Congress like to tout that they are saving money by not spending all their allowance … but that’s really a gimmick, as they can increase their budget as they deem necessary. For example, in 2016, Congressman Paulsen spent $1,189,246.16 and through three quarters of this year, he has spent $850,616.64 so he should easily stay under budget and actually be able to hold spending to 2016 levels. Hmmm … let’s test that … YTD3Q18 spending of $850,616.64 plus 4Q16 spending of $316,399.03 would result in an expected spending of $1,167,015.67 … well below the 2016 budget. Heck, even if there was allowance for inflation, the budget and spending should be below $1,200,000.00. BUT … there is a concern … Congressman Paulsen was defeated in his re-election bid … so he could spend his entire budget without any concerns. Well …. other Members of Congress have used their MRA to provide some pretty nice bonuses to their staff as they exit. Take for example, John Kline who retired in 2016 after representing Minnesota’s Second District. Communications Director $26,000 -vs- $32,000 … a change of $6,000. NOTE : This listing checked for the same name and same job title. It’s possible that some employees may have “earned” a salary increase based on performance yet considering the number of people who received a $6,000 change in salary, this may be a taxpayer-funded thank you gift from a retiring congressman. House members spent about $21.5 million more on their office payrolls for the fourth quarter of 2010, when bonuses are traditionally paid, than they spent for the average of the three previous quarters, according to LegiStorm, a Washington group that tracks congressional pay. Defeated and retiring lawmakers paid an average bonus of about $4,000. Returning lawmakers paid an average $2,300, the group found. 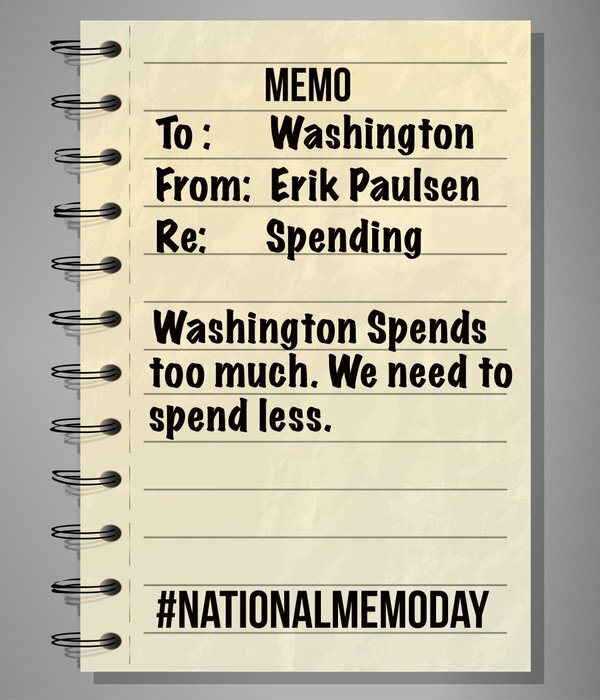 Considering Congressman Paulsen’s mantra — “Washington spends too much. We need to spend less.” — would question termination bonuses as something that should be curtailed. Congressman Paulsen has a staff of roughly 13 employees … and if he follows John Kline’s practice, that could mean the taxpayers spending $78,000 on pay. $78,000 is just one Member’s staff …. there are over 80 Members of the House that will not be returning next term … and that means the taxpayers would be on the hook for millions. And another hook … lump-sum severance using taxpayer dollars appears to be a violation of House rules. This will be a test for Erik Paulsen … will he be true to his mantra … or is he a fiscal fraud that duped Minnesota’s taxpayers ? IF he intends to award bonuses, he should explain to the taxpayers’ what the criteria that was used to determine the amounts.